Hello, this is Mark. Welcome to Russian Made Easy. If you have any doubts about your ability to learn Russian, you can set them aside right now. The fact is, your success in the language has nothing to do with whether you’re good at languages or not. It all comes down to the method you use. In these podcasts we’ll be using modern language learning techniques like contextual learning and pattern recognition to help you learn Russian in no time. All you need to do is just follow along…and be sure to speak out loud when prompted. Alright, let’s jump right in. I’d like you to listen to the following three Russian words and try to guess what they could possibly mean. Even if you have no experience at all, I bet you’ll get them. Ready? NOTE: I’ve chosen to not sound out the Russian words in this transcript using English letters. Instead, I suggest quickly learning to read Russian so you can follow along. There will be a link or banner to my popular read Russian video series somewhere on the right side of this page. You probably found it easy to understand the meaning of those Russian words. That’s because they’re cognates, that is, words that sound very similar between two languages and have the same meaning. Repeat them one more time after our native speaker. That rolled “r” will be tricky for you at first, but we’ll perfect it a bit later. So, just try your best for now. Now it’s your turn. I want you to fill in the Russian occupation at the end of each sentence. And please say it out loud. Again, those are cognates. And the good news is that there are hundreds of cognates between Russian and English. In essence, it means you come into the language already knowing hundreds of useful words. We just need to “russify” our pronunciation a bit. What does it mean? Well, the best way to learn the meaning is to let your brain figure it out on its own, by how it’s used in a sentence. This is what we call “Learning from context.” Let’s give it a try. Try saying, all in Russian: I am a doctor. Now say: I am an engineer. So, do not expect Russian to have a word for everything that English has a word for. But you can expect it to have some way of expressing the same things that we need to express in English. With that in mind, please say the following in Russian: I’m a businessman. We remember that my father is a doctor, right? Do you have a feel for what it means? “Он” is one of the Russian words for “he”. Try saying: He is a businessman. Now, any guess what OHA means? If you’re getting all these, you’re off to a great start! You start by learning anywhere from three to seven new words. You need to learn them from context, and then use them in a sentence or two. So you learn it, then use it. And then, here’s the key: You think about something else. still retain the new information you learned. But even a minute or two will suffice. Down the road, once you’ve developed your Russian vocabulary, you can do this kind of diversional thinking in Russian instead of English. Then the final step — after that brief time out — is to try to recall as much as you can of what you just learned. If you’re able to, try writing everything out. Otherwise, just say things out loud. So take a moment and ask yourself what were the new words and phrases we learned so far in this podcast. I’ll wait, while you find the PAUSE button. I’m a businessman, he’s an engineer, she’s a doctor. Я – бизнесмен. Он – инженер. Она – доктор. Try to say them again, this time before our speaker. Go! My favorite музыкант is Paul McCartney. So, tell me. What’s the Russian word for musician? Say: She is a student. How about: Sergei is a student. By the way, just with the tone of our voice, we can create questions with these words. For example, what do you think this person is asking? How would you ask: Is Katya a student? We’ve actually covered a lot of material in this podcast, and I’m tempted to stop here to let it sink in. But there are two more reaaaaallly easy cognates I’d like to toss in. So, take a wild guess which family members these are. Ready? How’d you do with these? If you got most or all of these, then you’re off to a great stat already in Russian. Next time we’ll talk about the biggest mistake that virtually all language students make. By the way, I’ve made a much shorter, practice version of this podcast. It has just the exercises, without the explanations. Grab a copy of those plus a full transcript of this podcast below. I’ll see you in the next episode. just did your first lesson, and I like how you present things. thank-you! I will try to practice these words today , and do the second podcast tomorrow. maybe this is finally the right method for me!! (I have tried a few and was always getting stuck, or overwhelmed!). Hi Katah, Glad to hear you’re off to a good stat with the podcast. How long have you been trying to learn Russian? I started in the winter 2012, but then had to much work to do during the summer months, I thought I would get back to it in the fall, but somehow, the motivation was not there. I was also having trouble with the teachign method of the school I was taking classes at…they had a different approach that did not quite work for me. I found your web page through FB. I know how to read, but have not learned much vocabulary (or at least I have not memorized any)…I have hope again !! Glad to hear we’ve given you hope again. And I understand your complaint about learning in a school. Often the lead instructors are native speakers and that’s the underlying problem: Native speakers are usually terrible at teaching their own language. Yes, they’re great at *speaking* Russian. But that in no way makes them experts at *teaching* Russian. I’ve been hitting on Russian from time to time, so I can read the letters, although I still need to work on russificating my pronunciation, and I know how to conjugate some verbs in the present tense using the simple pattern, but I stopped learning about 2 years ago, and here I am again starting with your lessons, even reviewing the very first one, which I stumbled upon it by accident in the iTunes’ podcasts. Wish you success in your project, really great work indeed. Thanks, Aboubakr! And don’t hesitate to write with any questions. We’re here to help you learn Russian! Could this be a supplement to Russian Accelerator course? I will start my russian classes next saturday and decided to make the first step to know where I am going. How come I can’t seem to listen to the podcast or download the file? A little help is appreciated. Hi! I’m not as new to the language as some of the other people here but I thought this would be a great add-on to another website I’m using that’s really helped. I know a lot of vocabulary and I can read it decently but I needed something to help me with the grammar, as I’m not even good at English grammar! This first episode definitely helped me out a whole lot to understanding how to form sentences. Thank you!! Also, what would be a good way to remember the vocabulary and such that I’ll be learning in later lessons? I use flashcards and they seem to help a lot but since you’re so good at teaching, maybe you know a better way? Handmade flashcards on good old cardstock are — in my opinion –the best way to study. Superior to all forms of digital flashcards, and flashcard apps I’ve encountered. Hi Mark; I’m still using your programme ‘Russian Accelerator’ – just happen to be a slow learner but hopefully this time next year I’ll be enrolling in the more advanced course. I only recently discovered the podcasts and have downloaded some on to my ipod. They are terrific thank you! Glad you’re enjoying both courses. I tried hard to make the podcast independent, yet complimentary to Russian Accelerator. This i a very nice method and not only to learn Russian… but to practice myself in english speack too! I’m going to use this in conjunction with the course I purchased. These are perfect for my drives and jogging time. Be sure to practice out loud (even while jogging). Enjoying this so much, have tried several and Mark your teaching method is right on. I am studying several languages aside from my native English, a daunting task. I have an interest not only in the language but also in the Cyrillic alphabet and the way to write in Russian…everything in the course is very helpful. My intention is to get these podcasts and then try your Russian Accelerator course to become fluent in the language. I have many Russian friends, they have commented that not only have I learned an impressive vocabulary, but also am PRONOUNCING in a very Russian manner…pretty great. Thanks again. Thanks for the kind words of support. I also have a free app where you can learn to read the Cyrillic (Russian) alphabet in just a few hours. Hope to see you in Russian Accelerator! you are amazing man. I love your pod you are making things easier than other podcasts. Amazing podcast. I feel like i have really learned a lot in the past month listening to the podcast. Thanks – this is great! I’ve been trying to learn Russian through Rosetta Stone for ages now and I’ve been getting nowhere – their “full immersive” way of teaching and not explaining what I’m learning to me in English at all was very frustrating and confusing. This, on the other hand, I’m actually getting! I’ll be loading all of these mp3s up onto my phone to listen to at all times! Is there any page where I can download the mp3s from all lessons, though? It’ll be a bit tedious to download page by page. So glad you like it, Nat. Yes, R/S is a very frustrating program. It’s honestly a very outdated concept. My main course (which this podcast is a primer for) is called ‘Russian Accelerator’ and we consider it the ANTI-Rosetta. We teach, we explain everything…and we actually make you conversational in Russian. As for downloading all of them at once…good question. I’m not the tech guy on the team, so look for a reply from one of them a bit later. Hi Nat, Technical support said there is no way to download all the files at once from this site, but if you go into i-tunes you can then load the podcast episodes all at once (if you have an i-pad, pod, etc. Here’s the link to the main page for the podcast. Hi Bob, Thanks for the heads-up. Fixed the link. Please have a look. looks great now, thanks for the fast response! and thanks for the great podcast/teaching! Brilliant teaching method! Thank you. Spasibo, Leesa! Let me know how you do on the mid-term and final of the series! Hi Mark – 1st thank you for a good podcast – I have tried a few but your approach to grammar rules – rules. This is a strange request but in one episode you mention you live in Ukraine. My wife and I will be in Kiev soon as part of me researching the stalinist wedding cake skyscrapers (7 sisters) and their related buildings. Hotel Ukraine in Kiev is an interesting example of this and very different from the others. I am very interested in how local people relate to these buildings and how important they are or are not. I have recently been to Hotel International in Prague and found a sense of dislike or ambivalence towards it there. I am soon to go to Moscow and re-visit the ones there as well as the ones in Warsaw, Bucharest and Riga. I would be very grateful for any views you may have or advice you may wish to share. My interest is based round a personal desire to see them and to produce some kind of record in an artistic form. I would like to thank you again for the very helpful podcast. Thanks for the kind words. And amazing coincidence that you ask about the 7 Sisters. As I write, one of the seven is visible out my hotel window. We are staying in the Mercure Hotel here in Warsaw. ANyway, I dont know much about how the locals think of them. Personally, I think the architecture is amazing. Anyway, I think taking trips and asking people directly is the way to go. This is a really great way to learn! I had already learned the Cryllic script and I knew some 250 words before starting with this. So this was a cake walk. But I am finding learning ahead via the traditional way to be difficult. I see this method as promising and I will continue listening to your podcasts. Thank you for this. I wanted to leave a quick post saying that Ive really found your podcasts helpful! I have been trying out a few different Russian learning methods, and your approach has made the most impact. I typically listen to 2-3 podcasts a week while commuting to work. Thanks, Lauren! Please let me know how you do on the mid-term and final! I can’t even begin to explain how easy you have been describing this for me. I already knew how to write and pretty much understand Russian language but you nailed it on the grammar for me. I went from a letter grade C in my Russian II class at my university to an A.
I’m guessing the audio portion no longer works?? message of some kind, or is the audio in this lesson just not working for you? Please try a different browser and see how that goes. Hello, You can read the main body of the blog post or download the pdf at the end of the lesson. Thank you very much for your lessons! Your teaching method is effective and it works! I’m from Rome, Italy, and I’m sorry for my bad english… With your helpful podcast I could learn two languages! So, I’d like to thank you again. Is Tatiana also a common Italian name? This is the best Russian language course that I have ever seen. I can see this as a very successful app if sold. When is the app coming out? Thank-you for this great resource! I’ve only been learning for a couple of months, trying various different approaches. I think I’m doing ok so far but your approach here (I’m only 3 lessons) seems like a very good way to boost my take-up of the language, and I appreciate that each lesson is not too long, making it easier to fit around other demands. And I’m VERY happy to see that, despite the “Made Easy” title, you have chosen to use Cyrillic rather than transcription (most of my effort so far has been to get to grips with the alphabet, reading and spelling, and some vocab). Do you have your mnemonics for Russian in a pdf file? Your example of “Not for all the TEA in CHIna” was excellent. Mark, thank you for making this lessons available, they are great! I also learned the cyrilic alphabet with your videos on Udemy, fantastic! You are a good person. Cheers from Brasil! Thanks for your kind words about my Russian Made Easy podcast. Thank you Mark I start with you APP learning the alphabet and I can read don’t know what I say but with lessons I get motivated to continue learning. This will be my second language to learn I am Argentinian and living in Canada and marriage to a Russian woman and she doesn’t know I try to learn Russian – Hope I learn some before she come from Russia. After many (intermittent) attempts to learn Russian I’d pretty much decided that although the language itself was not terribly difficult to master; the methods of teaching it were! Needless to say, I’m so glad to have FINALLY found a teaching method “in tune” with how most of us actually learn language. Outstanding Job and Thank You for making this available. This is an awesome material to learn with, I am really excited about learning more. Keep up the good work. Great! My mother language is Serbian. My second is Russian, but I forgot a lot. My third is English, and now I’m back to learn Russian again. This is the best method I came across! I wish there were websites for other languages like this one. Thank you, Mark! I arrived here because … I had decided to learn the Russian alphabet as a first step to learn the language. Looking for applications for my phone I found RusAlphabet and I was delighted with the method used, so I decided to visit you on your website. Great decision, indeed. The funny thing is that I was already developing a similar system to learn the Japanese syllabaries (hiragana and katakana), but your method is simpler, so I’ll adapt what I was doing. My English is not too good, but I find it interesting to practice it by learning a third language. Thank you for existing. A big hug. Actually, I helped design two Japanese reading apps. One is called ‘2 Hour Hiragana’ and is similar in style. to the Katakana app so he can learn that when done with Hiragana. I learn by reading; it somehow helps me to hear the words. So this method you present is super helpful. Is there a way to pause the audio as I read the the webpage without scrolling to the top? I’m afraid as the lessons get more complicated this might be an issue. I suppose I could download the lesson and pause from a separate player, but if there is a simpler method I would appreciate any advice. Glad you’re enjoying the podcast, Chris. but your idea to read and have a separate audio player open may work. scroll in the other browser tab. thanks for the podcasts , they are great . I am off to the world cup in June so want to rush through some basics but fear I have left it late. Anyway have you thought of a podcast for World Cup travellers ? Thanks for the kind words about my podcast. So glad you’re enjoying it. it’s a real pleasure to share it with others. 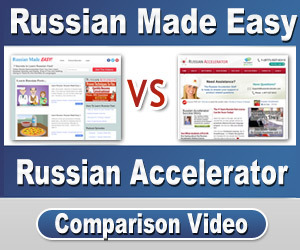 I hope to welcome you to my Russian Accelerator video course one day.